As many as 13 persons, including former MLA Mehar Singh Chauhan, were killed and 37 others injured when a Himachal Road Transport Corporation (HRTC) bus (HP-03B 6121) rolled 150 feet down into a gorge at Balghar near Theog in Shimla district, 50 km from here, this evening. Tribals in landlocked Lahaul-Spiti, Pangi and Leh-Ladakh and the Manali Hoteliers' Associations (MHA) have got a shot in the arm after glaciologists said 13,050- ft-high Rohtang Pass has no glacier in its 10 km radius as the glacier was de-glaciated 9,000 years ago. Tourists visiting Manali to avoid the heatwave in the plains have to wait to catch a glimpse of snow. Complying with the National Green Tribunal (NGT) order to conserve the fragile ecology of the Rohtang Pass, the district administration has regulated the passage of vehicles beyond Kothi. Industries Minister Mukesh Agnihotri today lashed out at former Chief Minister PK Dhumal for alleging that price rise of cement was a result of nexus between the state government and cement companies. While private engineering colleges are up in arms against the stringent conditions and norms being implemented by the All-India Council for Technical Education (AICTE) to ensure quality education, students are suffering as a large number of technical institutions have employed “unqualified” staff. The Kullu police have recovered gold ornaments stolen recently from the Durga Mata temple. The temple is on the premises of the Seema Suraksha Bal Basic Training Centre at Shamshi here. A Medical Council of India (MCI) team today visited the Employees State Insurance Corporation (ESIC) Medical College at the Ner Chowk in Mandi to inspect facilities for the beginning of the first batch of MBBS students. As 40 per cent weightage to Class XII score will be given during the Joint Engineering Entrance Examination (JEEE), students under the Himachal Pradesh School Education Board are likely to suffer as only 57 per cent of the total students passed the Class XII examinations this year. The norm, which was introduced last year, has disappointed a large number of students willing to sit in the exam. A six-day medical education programme on homoeopathy started at the Solan Homoeopathic Medical College and Hospital (SHMCH) at Kumarhatti today. Dr Narinder Awasthy, Controller of Examinations, HPU, was the chief guest on the occasion. The auditions for Himachal Fashion Hunt-2014, organised by the Inter National Institute of Fashion Design (INIFD), started here today. The occasion was marked by a mini fashion show of dresses designed by INIFDians. 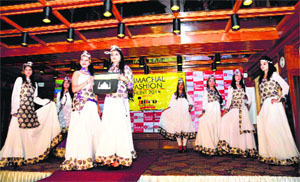 Himachali, Chinese, Gujarati collections, along with Bird’s nest and lehanga collections, were displayed. Bolstering the low-key celebrations of 150 years of the erstwhile capital of the Raj here, the district administration will hold a three-day art festival from May 28. More than 42 artists across the country are set to showcase their talent at the festival. Residents and tourists can also display their talent dueinf on-the-spot competitions at the Gaiety Theatre and Daulat Singh Park. Whenever I am in Janjheli, I feed my eyes with the beauty and bounty of greenery. I entertain myself with the rippling Bakhli river. I enjoy the meadows bedecked with flowers. I view the forested mountains with awe. I break free from the spell of modernity to rejuvenate myself with the lavishness of the celestial glory and find the nature entering into my soul (See photo). Its maker never charged anything for it. It is free because He has given me the body and soul to behold it. Passport applicants in Kullu are a harried lot as the online payment gateway of the Passport Seva Kendra (PSK) for Himachal Pradesh in Shimla has not been operational for the past month, says Bhuvnesh, an applicant. Ashwini Kumar, Deputy Director, Directorate of Tourism and Civil Aviation, Kullu, said several cultural programmes would be organised at places of tourist interest in Kullu and Lahaul and Spiti districts from June to September this year. Tourists would be apprised of the rich cultural heritage of the area, he added. The HP High Court today issued summons to the DC and the SP of Kangra to appear before the court on June 2 over the confinement of an old woman in a cowshed. The swimming pool, situated at the Indira Gandhi Sports Complex, was made functional today. It had been lying closed for the last two years. Eight women and two children were killed on the spot, while three others succumbed to their injuries on way to hospital. Mehar Singh was elected an MLA from Theog in 1977 and was a senior BJP leader. The ill-fated HRTC bus carrying over 60 passengers, mostly students of two government and one private school and women, was on its way from Theog to Talli Neri and met with the accident a few minutes after it left Theog. “Eight women and two children died on the spot and their bodies were handed over to their relatives after conducting an on-the-spot postmortem, while the injured have been rushed to the Indira Gandhi Medical College Hospital (IGMC), Shimla, where they are undergoing medical treatment,” SP, Shimla, Abhishek Dullar said. A case has been registered and investigations are in progress to ascertain the cause of the accident. A magisterial inquiry has also been ordered, Transport Minister GS Bali said. He announced an immediate relief of Rs 2.50 lakh to the next of kin of the deceased and injured persons. Rohtang Pass, known as a ?pile of dead corpses? to the tribal, has become a new battle ground among environmentalists, tribals, hoteliers and NGOs after the National Green Tribunal (NGT) banned the entry to Rohtang Pass without permit on February 6, 2014. They have sought permit-free entry to their homeland. "There is no glacier in its 10-km radius," he said. Dr Milap said the annual discharge of water into Beas had come down. Had the commercial activities, including vehicular traffic, not impacted the melting of snow, the discharge of water would have been better, he said. Armed with scientific observations, the tribals in Lahaul-Spiti, NGOs and hoteliers have requested the Chairman, NGT, to exempt them from the permit-based entry. The Kullu-Manali Paryatan Vikas Mandal (KMPVM), an umbrella body of taxi operators, have also requested the Chairman, NGT, to reconsider the order in public interest when the tribunal sits in Shimla on May 29. They also cited a report of the Physical Research Laboratory, Ahmadabad, in which it was said that ?no black carbon imprint was detected at Rohtang Pass. "Meanwhile, the plying of CNG vehicles from Vashishat onwards seems to be a dream only. Not even a single CNG pump exists in Himachal, said MHA and KMVM members in their plea to the NGT MHA members claimed. The Manali-Leh highway is a lifeline of the people of this region. Chinese monk Hiun Tsang also used this route and identified monasteries and Kullu? 's proud temples and stated about the pilgrims crossing Rohtang Pass to reach Triloknath on foot or ponies. The people of Lahaul-Spiti and Kullu were never banned or issued permits to cross Rohtang Pass for centuries. However, they support restriction on tourist vehicles plying on the Manali-Rohtang road to lessen pollution. An abrupt shift to CNG or electronic transport will render hundreds of taxi operators unemployed. The shift from the BS-IV fuel system to the Bharat III stage should be taken up in a phased manner. The abrupt shift would render thousands of vehicles off the road," they added. Manali SDM Viney Dhiman said the space for parking of vehicles in Marhi would be available in a couple of days and this would relieve the congestion in the region. He added that in the wake of the recent snowfall, no tourist vehicles was allowed to go beyond Beas Nala. Meanwhile, The Border Roads Organisation (BRO) is trying to restore road connectivity to the Rohtang Pass and the Lahaul valley. Vehicles are being stopped at Gulaba and the residents of Kothi village regretted that the school-going children were forced to walk about 6 km till Palchan due to traffic jams. A large number of vehicles wait in lines for further journey, causing a traffic jams. Rahul, a tourist from Delhi, said while they were enjoying the chill in the air, the long wait at the Gulaba barrier was troublesome. He said, "I had brought my own car and was not aware about the token system to visit the snow-point for which I had to wait for over four hours." Anil Sharma, president, Manali Travel Agents' Association, said, "Snow and winter sports are the main attraction for tourists and forcing them to wait will have a negative impact on the number of visitors." 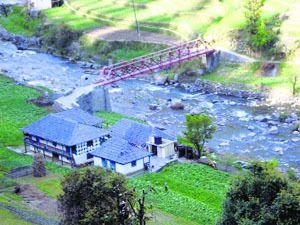 A Manali hotelier regretted that while huge funds were collected through the green tax barriers, set up exclusively near Manali, very little had been done to improve the basic infrastructure of the region for long, thereby, adding to the miseries of the town due to an increase in the number of tourists. Villagers of Palchan, Kothi, Kulang, Buruwa and adjoining areas had earlier resented the setting up of a skiing resort in Kothi. With an improvement of the basic infrastructure, there will definitely be an increase in tourist inflow and this would provide employment to the residents. In a statement issued here, Agnihotri said such nexus existed during the Dhumal government when interests of the state had been mortgaged with the cement companies. “Had Dhumal taken action against the JP Company, the High Court would not have imposed a fine of Rs 100 crore on the company,” he said. He added that it was only after the Congress government came into power that action was being initiated against the cement companies. “How was it possible for the cement companies to produce 3.46 million tonne cement against the production capacity of 2.05 million tonne?” questioned Agnihotri. “It was clear that the Dhumal government showered special benevolence on the cement companies and free hand was given to them,” he said. He said it was the present Virbhadra government which had issued orders to the JP Company to undertake energy audit for the first time. Last year, the State Regulatory Commission for private educational institutions had inspected the institutions and asked them to remove the shortcomings pointed out in the inspection report. But before the commission could seek the compliance report, the High Court quashed the Regulatory Commission Act and the commission also stood abolished. Now, with the revival of the Regulatory Commission, the private technical institutions have come under the scanner and the commission has started the process of enforcing the norms fixed by the AICTE and the erring colleges are feeling the heat. The Supreme Court had entrusted the functions of the AICTE to the University Grants Commission (UGC) last year. But now, the powers have been restored to the AICTE and it is enforcing the norms. The UGC had decided that no new technical institutions would be opened, no new courses would be started and also the number of seats would not be increased and the AICTE has also not annulled the decision. A large number of private engineering colleges, including the colleges run by private universities, have employed unqualified staff and the Regulatory Commission had detected in a large number of cases BTech qualified teachers were teaching the BTech students, affecting the quality of technical education. Sources in the commission said the prime concern of the government was to ensure quality of technical education so that the pass outs could get gainful employment. The private colleges had pleaded that they were not getting MTech teachers, but it was no excuse for employing unqualified staff and play with career of the students, said the sources. Student leader Rahul Prashar said it was the responsibility of the government and other statutory bodies to fix the norms and implement these in letter and spirit, but no action was being taken against the technical institutions that did not have qualified faculty and students were being taught by unqualified persons putting their future at risk. “In many institutions, BTech students are being taught by BTech qualified teachers which is a farce and mockery of the system. Names of the unqualified teachers are available on the websites of the universities. A similar situation prevails in BBA, BCA, MCA and MSc courses,” he added. However, educationists have hailed the decision of the government and the commission to enforce the norms. They said the quality of education was the main concern and there should be compromise on it. “Technical institutions must have qualified staff, admission norms should not be relaxed and proper infrastructure should be in place for imparting quality technical education,” said Dr NK Sharda, former Pro Vice-Chancellor, Himachal Pradesh University. The Wildlife Wing of the Forest Department is all set to sign an agreement with the University of California not just to check the growing monkey population, but also to study the diseases afflicting simians, which can pose a health hazard to the local population. A two-member team of veterinary experts Dr Rob Atwill and Dr Brenda from the National Primate Research Centre, University of California, will prepare a detailed proposal, outlining various initiatives which need to be taken through a multi-pronged strategy. The two had visited the Jakhu temple in Shimla and other shrines which have a huge monkey population and also Hamirpur and Kangra districts. There is a proposal to set up a laboratory in Shimla to study various aspects. The sterilisation programme being undertaken by the Wildlife Wing will continue as the experts from California have appreciated these endeavours which will in the long run help check the growth of monkeys. “They are expected to send us a proposal within a month and it is only after we are satisfied with the proposals, we will sign the agreement with the University of California,” said Lalit Mohan, Chief Wildlife Warden. He said besides suggesting ways and means to check the population growth of the monkeys, the problems being created by them like destroying fruits and crops and attacking people would also be tackled. Another aspect which the Forest Department wants to look into is the possible threat of diseases that the human population can face from the monkeys that practically live in inhabited areas. "The team will also study the health hazards that this huge population of monkeys can pose in view of their close contact with human being," he said. Officials said the US varsity could also consider extending financial support in some areas relating to monkey menace. This could go a long way in helping Himachal combat the problem. The monkey menace has resulted in a large-scale damage to crops and fruits, forcing farmers in hundreds of panchayats to give up cultivation of crops like maize and off-season vegetables. The monkey census undertaken in June 2013 had put the number of simians around 2.26 lakh, while their population as per the 2004 Census stood at 3.19 lakh. 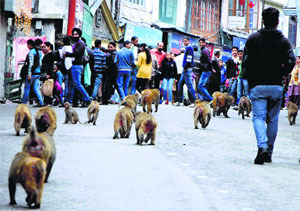 A total of 84,000 monkeys have been sterilised at the four centres in Shimla, Gopalpur, Una and Hamirpur. Three more centres will come up at Paonta Sahib, Sundernagar and Chamba, while two new sites have been identified near Una and Bilaspur. The police had nabbed two recruits on May 21 from Shamshi and Hamirpur and part of the booty was recovered from one of the culprits. The remaining itmes were recovered today from a woman residing at Banjar, who was arrested yesterday. The duo was under surveillance after the finger of suspicion was pointed at them by the SSB authorities. While one accused hails from Orissa and the other from Pathankot in Punjab. Kullu DSP Sanjay Sharma confirmed the recovery of the ornaments and said the trio were in police remand and would be produced before the court on May 28. The three-member team reached the college this morning. The team inspected classrooms, biochemistry, psychology and anatomy departments, laboratories and the practicals room. They also inspected hostels for boys and girls, besides the residential housing facility being created for the faculty and other staff. Since ESIC Medical College is linked with the Zonal Hospital, Mandi, till the ESIC starts its own hospital at the Ner Chowk, the team also visited the Mandi hospital. 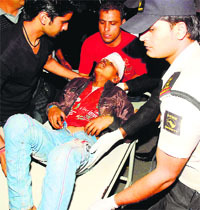 The MCI team checked the Mandi hospital's Emergency Department. The college will admit 100 MBBS students (40 from the state, 40 from the open pool and 20 seats are reserved for children of ESIC employees) this year. Later, a 500-bed super-speciality hospital will also be started at the Ner Chowk. The visit of the MCI team is important as its approval is mandatory for the commencement of MBBS in the college from this session. Former Union Labour Minister Oscar Fernandez, while inaugurating the college building on March 5, had asked the ESIC authorities to start the first batch of MBBS students from this session. The residents are also eagerly awaiting the opening of the medical college as it will to improve the health facilities in the area. A vice-chancellor of a private university, while regretting the dismal result of the state board, said fewer students would qualify the exam due to the norm. Citing the example of his university, he said admission in engineering courses had dipped from 70 per cent to 39 per cent and this could go down further under the present circumstances. Terming the JEEE evaluation system as discriminatory for underprivileged students, Balbir Singh, Registrar of a private university, said the JEEE should be the sole criterion for the selection of students. 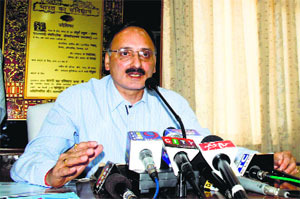 He added the students who studied in leading private schools and took coaching classes for the test throughout the year ended up getting more that 90 per cent marks, while those hailing from rural areas barely managed to get 70-80 per cent marks on the basis of self-study in Class XII despite obtaining a high grade in the exam. As different state boards are having varying standards of education, it is not possible to equate their results. Though the JEE Interface Group (JIG), the apex committee responsible to devise the evaluation pattern, has worked out a special procedure to normalise Class XII board marks of various state boards, academicians do not consider it an accurate way to judge students. According to the formula, percentile scores of different boards/examining bodies are correlated to a common all-India JEE main percentile score. A review of JEEE admissions, which was done last year, has shown that a large number of students from Andhra Pradesh passed the JEEE exam in comparison to the students from several other states. The programme is sponsored by the Rashtriya Ayurveda Vidyapeeth, Department of Ayush, Government of India. It is for the first time that a national-level education programme is being organised in the state where 27 delegates from various states like TN, Rajasthan, Gujarat, Assam, Punjab, MP, Maharashtra besides Himachal are participating. Dr PK Shukla, Professor and Head, Department of Physiology, emphasised on different applications of homoeopathy. Dr JD Daryani, former head, MPK Homoeopathic College, Jaipur, said various diseases like depression, anxiety, schizophrenia, etc were effectively treated under this system. Dr NP Singh, Principal, SHMCH, said educational programmes were a must for teachers of homoeopathy. The auditions for Himachal Fashion Hunt-2014, organised by the Inter National Institute of Fashion Design (INIFD), started here today. The occasion was marked by a mini fashion show of dresses designed by INIFDians. Himachali, Chinese, Gujarati collections, along with Bird’s nest and lehanga collections, were displayed. The competition will be held in three phases and the winners will get the opportunity to be a part of Femina Miss India, INIFD annual shows and Lakme Fashion Week. Bolstering the low-key celebrations of 150 years of the erstwhile capital of the Raj here, the district administration will hold a three-day art festival from May 28. More than 42 artists across the country are set to showcase their talent at the festival. Residents and tourists can also display their talent dueinf on-the-spot competitions at the Gaiety Theatre and Daulat Singh Park. The art festival aimed at recreating the lost glory of legendary figures like Noble laureate Ravinder Nath Tagore, Gaginder Nath Tagore, Amrita Shergill, Satish Gujral, Shobha Singh, Ram Kumar and others, who spent time in Shimla making this tourist town as a town of artists as well. The festival will be held every year apart from the popular international Shimla Summer Festival. About the motive behind organising the festival, Deputy Commissioner Dinesh Malhotra said the festival would host an open theatrical art performance to pay tribute to the renowned artistes. More than 42 artistes had been invited to showcase their talent at different venues like Daulat Singh Park and Travern Hall of the Gaiety Theatre here. “The idea is to remember Shimla as a city of artists that in turn will give tourists and residents a real feel of participation. Walk-in artists, young or old, can show their talent in on-the-spot competitions,” said Malhotra, who also released a logo of the festival. The event will be included in the calendar of events and held from May 28 to 30 every year. “We will provide logistic support to painters who will show their talent on-the-spot drawing natural and scenic beauty of the city on the canvas,” he added. The work of art would be owned by the district administration, which would be displayed in various departments. The competition is open for the tourists and amateur painters as they can apply on the spot, Malhotra said. I was at Janjheli again after two years and read that the British wanted to develop the area as a hill retreat, but the raja of Mandi did not approve it. A visitor to Janjheli had blogged thus: “Beautiful is an understatement when one is describing the breathtaking vistas of this hilly pocket in Mandi district. It is no surprise that the British were so impressed with the lush green meadows that they wanted to make Janjheli their summer capital instead of Shimla. Because of the adamant attitude of the ruler of Janjheli, their dreams couldn't materialise.” Is there any truth in the British inclination towards Janjheli? Let us see. A brief history of Janjheli is that Saraj was earlier a part of Kullu, but Raja Sahib Sen (1554 AD) of Mandi assisted Raja Jagat Singh of Kullu in an attack on the Raja of the Lag Valley. During the partition of the territory after the victory, Mandi received what is known as Saraj Mandi (Janjheli) and Kullu took the portion which goes by the name of Saraj Kullu (Ani etc). I tried to locate the period when the British might have thought of developing the area into a hill retreat. It could be prior to 1864 when they had declared Shimla as their summer capital. After 1864, they paid attention to develop Shimla. But, Sir John Lawrence, the Viceroy who had decided that Shimla was the most suitable hill station to be the summer headquarters of the Government of India and used every argument to get this accepted by the India Council at London was earlier the Commissioner of Jalandhar and the political agent of the hill states. In the autumn of 1846, he had visited Mandi on his way to Kullu. The hot and sticky weather of the plains never suited him because of his ill health. He always preferred a hill station to stay in summers. The only possibility is that he might have suggested to convert Janjheli as a hill retreat in or around 1846, around which the proposal is believed to have been rejected by Raja Balbir Sen, who was the de jure ruler of Mandi then. It is surprising why the proposal was not accepted by the Raja when Vigne, who had visited Mandi during the course of his journey through the hills during Balbir Sen’s time, spoke of him: “He was uncommonly civil and prodigal of his expressions of regard and friendship for the English”. Besides, Mandi after the Sikh expedition in the early 1840s, came under the direct charge of the Commissioner of Jalandhar in 1846, on the basis of a treaty that concluded on March 9, 1846, between the British Government and the Sikh durbar. Had the British wished to convert Janjheli into a hill retreat, they could have easily done it because they had control over Mandi in 1846. The story of converting Janjheli into a summer capital of India or a hill retreat by the British and the refusal by the Raja of Mandi is, therefore, only a myth, which is not based on facts. This, in no way, lessens the place's extraordinary beauty. When Janjheli provides one the velvety carpet of lush green grass and the music of flowing river matching with whistling deodars and chirping birds, one is in the capital of capitals. 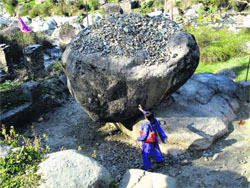 Just 3 km short of Janjheli, by the side of the main road, is Pandav Shila comprising two rocks -- a huge one on the shoulder of another. It is said to have been placed there by Bhim and fulfils one’s wishes when one throws a stone at it (See photo). Count the stones, count the wishes! A push with hands -- and this rock feebly rocks. He said, “I had to visit the PSK in Shimla as the online appointment system is not working but I was not allowed to enter the office by the security guard. He advised me to pay the required fee through a challan at an SBI branch and then seek an appointment. It took me five days to update the fee paid through the challan and that, too, after submitting a grievance request to the authorities through the PSK portal (www.passportindia.gov.in)”. Vinay, another applicant, said he, along with his friends, had to visit the PSK and seek assistance of a close acquaintance to submit their applications as none of the payment options provided on the portal worked for them. A bank employee, Jaya, said she had to take leave from her office to visit the PSK as she was not able to secure an appointment online. Swati, an executive of the SBI in Kullu, said there was no problem in accepting payment online through a debit card or net banking. The customer care executive of the passport kendra said there was no problem with the portal and they were not aware about the problem. The executive advised people to follow alternate options in case of any problem. Another option for applicants is that they can apply for "tatkaal" service by doling out Rs 2,000 more than the actual fee of Rs 1,500. However, a passport applicant regretted that the police were advising them to stick to the routine course for the required clearance certificate on the pretext that formalities would double in case of "tatkaal" applications. Meanwhile, repeated calls at the Regional Passport Officer, Shimla, remained unanswered and even an e-mail sent to the office ID was not replied. Several cultural programmes would be held in June and July in Kullu. In August and September, cultural programmes will be held in Lahaul and Spiti. "Those who are registered with the Language, Art and Culture Department and are willing to perform nati and Lahauli dances at the Mall Road, Club House, Dhungri, Solang Nala, Marhi, Rohtang, Naggar, Kasol and Manikaran can apply before May 31," Kumar said. The department has planned to engage over 15 troupes in Kullu and 12 in Lahaul and Spiti. Meanwhile, the move of the Tourism Department hasbeen welcomed by many people in the tourism industry. "Though the state government has announced an ambitious tourism policy and tourism has been declared an industry, the authorities seem indifferent when it comes to infrastructure building," said a travel agent. "The Department of Tourism tries to create proper infrastructure for tourists but the pace of development is very slow. It seems that the government has failed to harness the potential of the region," said Vivek, a tourist from Delhi. The need of the hour is to promote new areas. Tribal areas of the state need to be developed from the tourism point of view. A Division Bench comprising Acting Chief Justice Mansoor Ahmad Mir and Justice Tarlok Singh Chauhan passed the orders on a petition by the Sarvjan Hit Manch, Jaisinghpur (Kangra), on the basis of a media report. Chanchala Devi (65), hailing from Kharat village in Nagrota Bagwan, had been confined in a cowshed for the last two months. The woman had lost her arm in a fire accident. She has three daughters and a son. Her daughter-in-law had committed suicide and her son was in jail. As there was no one to look after her, she had been confined to the cowshed. Raghunath, a relative of the woman, was providing her food. But now, he was showing inability to continue. Deputy Commissioner Abhishek Jain, who was the chief guest at the re-inaugural function, said Rs 10.5 lakh was spent on repairs at the pool and Rs 5.5 lakh would be spent to strengthen the boundary walls and provide other infrastructure such as lockers and pool chairs. The pool facility had been outsourced to a private party for operation and maintenance, said the DC, adding that swimmers would have to pay fixed hourly charges to make use of the facility. The Aquatic Sports Association thanked the Deputy Commissioner for getting the pool functional. Dr Arushi Jain, chairperson of the District Red Cross Society, Additional Deputy Commissioner Darshan Kalia, SDM Dhanvir Thakur, District Sports Officer OP Bhota, Sports Department coaches, office-bearers of various sports associations and international swimmer Sanjeev Tokas, who represented the service providers, were among those present on the occasion.